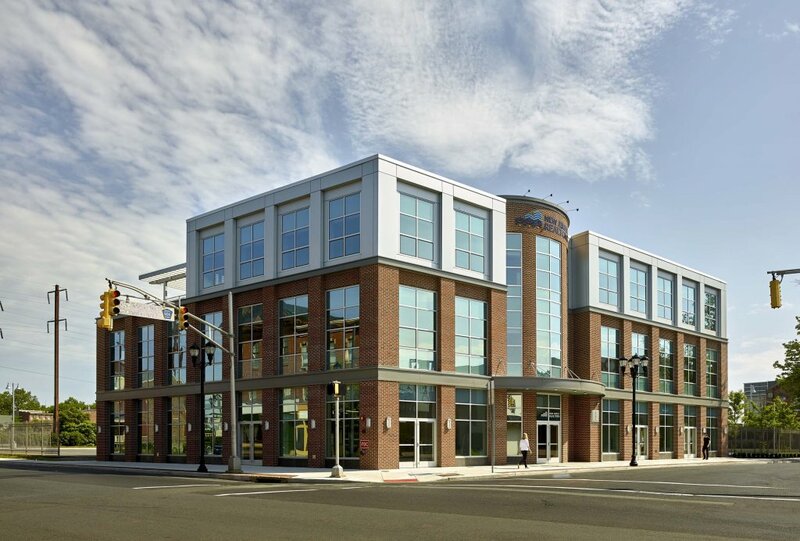 The new headquarters for New Jersey Realtors is a three-story building comprised of the new headquarters for NJR and leasable tenant space. The program includes offices for current staff, as well as offices for growth and space for the Leadership Team and guests. Breakout Meeting Rooms as well as a large Conference Room that can accommodate fifty people are being provided adjacent to a third floor outdoor observation deck for larger events. Production studio space for webinars is also being provided. In addition to the building shell and core, CCH was responsible for the interior office design for New Jersey Realtor?? ?s inclusive of the selection of all finishes as well as the office furniture. CCH worked with a local artist to commission photography for the space. This project is a three-story, 22,000-square-foot structure of brick, pre-cast concrete and glass that was designed to be both forward-looking and reflective of the city’s historic industrial structures nearby. A cylindrical entry lobby connects to the core and a fenced-in outdoor patio tied to one of the ground-floor suites can accommodate social events. The architect was Clarke Caton Hintz, of Trenton, and the builder was Barr & Barr Inc., of Trenton.